St. Mary’s Sherriff’s Department Sgt. Brian Hartz, second from right, presents a certificate of appreciation to the IAM for their fundraising on behalf of the Special Olympics. From left, Carlos San Miguel, Retiree, Community and Membership Services Director; Angela Bennett, Women’s and Human Rights Department Administrative Secretary; Annette Hartz, Information Systems Analyst; Brian Hartz and Diane Babineaux, General Vice President. The St. Mary’s County, MD Sheriff’s Department recently honored the IAM for raising nearly $700 for the Special Olympics. 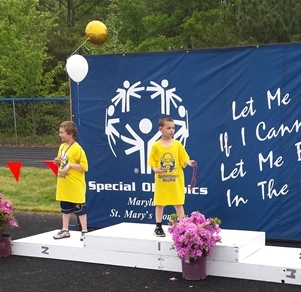 Eight-year-old Special Olympian Larry Rowley, Jr., son of IAM Reports Technology Clerk Toni Rowley, accepts the first place medal for relay in the 2014 Spring Games. “The money raised by the IAM will go directly toward helping Maryland athletes compete in the Special Olympics,” said Sgt. Brian Hartz, who presented a certificate of appreciation to IAM General Vice President Diane Babineaux and Retiree, Community and Membership Services Director Carlos San Miguel. 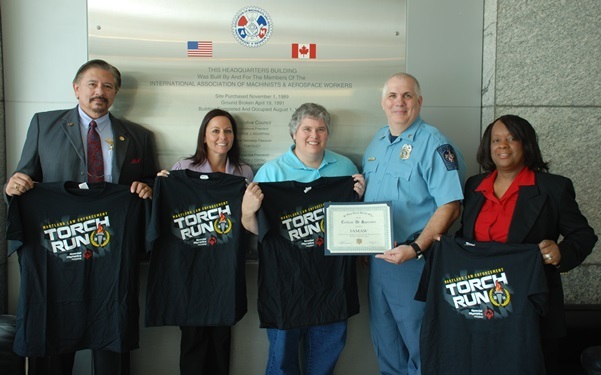 Hartz and the St. Mary’s County Sheriff’s Department take part in the Law Enforcement Torch Run, a grass-roots fundraiser in which officers and athletes run the Flame of Hope to opening ceremonies of local, state and national Special Olympic Games. Special Olympic athletes like 8-year-old Larry Rowley, Jr., son of IAM Reports Technology Clerk Toni Rowley, benefit from the IAM’s fundraising efforts. Larry Rowley has competed in swimming and numerous track and field competitions. The Special Olympics is the world’s largest sports organization for children and adults with intellectual disabilities, providing year-round training and competitions to more than 4.2 million athletes in 170 countries.